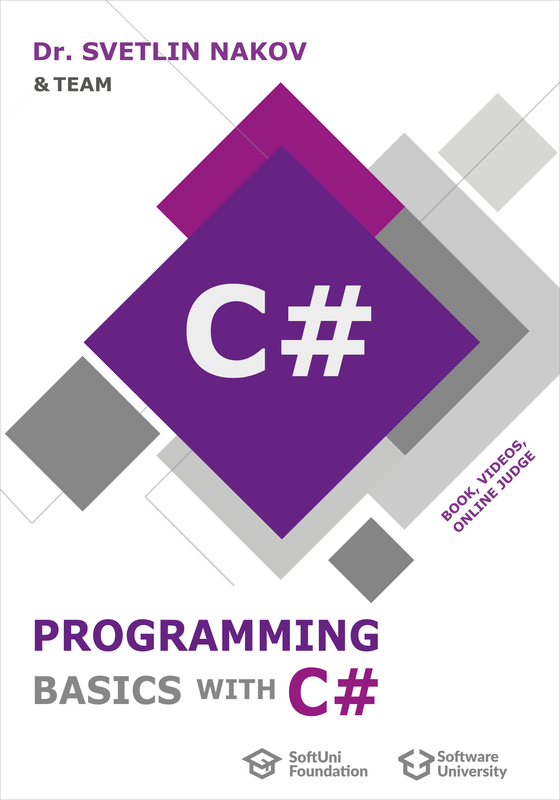 The Free Book + Video Course "Programming Basics with C#"
The free book "Programming Basics with C#" introduces the readers to writing programming code at beginner level (variables and data, conditional statements, loops and methods) using the C# language. It combines tutorial-style learning content with video lessons, code examples and a lot of practical coding exercises with automated online evaluation (judge) system to ensure efficient learning. Watch the promo video about this book + video course: https://youtu.be/_F606F3OgmQ. This project is not entirely accomplished. Once we finish it, we will publish the book in PDF / MOBI / other formats. All authors, editors, translators and contributors: Aleksander Krastev, Aleksander Lazarov, Angel Dimitriev, Vasko Viktorov, Ventsislav Petrov, Daniel Tsvetkov, Dimitar Tatarski, Dimo Dimov, Diyan Tonchev, Elena Rogleva, Zhivko Nedyalkov, Julieta Atanasova, Zahariya Pehlivanova, Ivelin Kirilov, Iskra Nikolova, Kalin Primov, Kristiyan Pamidov, Luboslav Lubenov, Nikolay Bankin, Nikolay Dimov, Pavlin Petkov, Petar Ivanov, Preslav Mihaylov, Rositsa Nenova, Ruslan Filipov, Svetlin Nakov, Stefka Vasileva, Teodor Kurtev, Tonyo Zhelev, Hristiyan Hristov, Hristo Hristov, Tsvetan Iliev, Yulian Linev, Yanitsa Vuleva, Marina Shideroff, Nelly Karaivanova, Bilyana Borislavova, Kalina Milanova, Karina Cholakova, Marieta Petrova, Mirela Damyanova, Petko Dyankov. Enjoy reading and do not forget to sign up for the Practical Free Course "Programming Basics" coming together with this book, because programming is learned by practice, code writing and solving many, many problems, not just by reading!